As with all notice types, manual keys can be set up as your only notice type, or can be used in combination with other notice types. Proceed to the "Voters" page of setup. 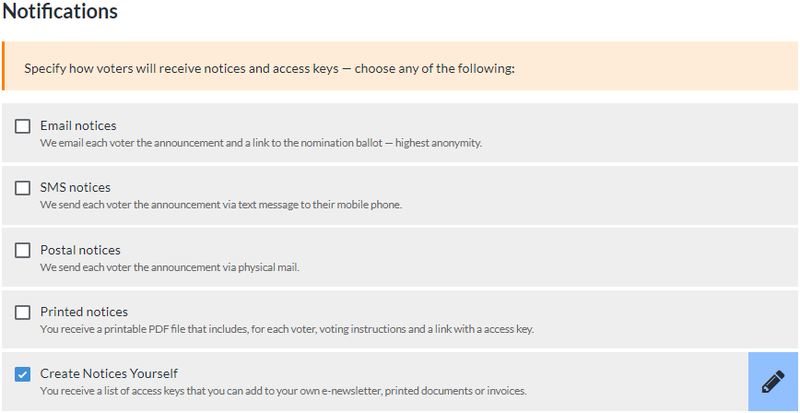 There are several ways that you can handle the manual keys from here; choose one of the following, depending on whether you want to be able to associate a specific voter with their access key in Electionbuddy while the election is live. Scroll down to "Voter Information". Scroll down to "Voter Information". A voter list is required for ballot IDs. There must be one ballot ID in your voter list for each access key that Electionbuddy must create for your election. The ballot IDs do not have to be significant, but they do have to be unique, so even something as simple as sequential numbering will work for your voter list of ballot IDs. Insert a voter list of ballot IDs for your voters by copying and pasting, typing a voter list, importing a voter list from a previous election, or by importing a CSV file. Finish setting up your election, proceed to the "Review" page, and get your election started. Edit your notice templates for your other notice types as required, and then proceed to the "Voters" stage of your election setup. You will see that ballot IDs are automatically enabled in the "Voter Options" settings. Ballot IDs are mandatory when using multiple notice types for an election (see our article on Ballot IDs for more information). Scroll down to "Voter Information". A voter list is required. Ballot IDs "1" and "2" correspond to voters receiving email notices. Ballot IDs "3" and "4" correspond to voters receiving SMS notices. Ballot IDs "5" and "6" correspond to voters receiving manual keys, as there is no contact information for them. Locate the ballot ID that corresponds to the manual key that you want to download in your voter list. You can do this manually, or by searching in the search bar at the top of the voter list. Check the checkbox associated with that voter. A window will appear, confirming that you want to surface your voter's key. Confirm that you want to, and the key will appear on the window. Take record of the key, and close the window. That voter's status will turn from "Available" to "Key Surfaced" in your voter list. Locate the "Actions" menu in the top-right of the screen. From the drop-down list of options that appear, choose "Download Keys". If you need to distribute physical voting material to your voters, in addition to any electronic notifications they receive, choose "for everyone". However, if they have contact information, please note that this information cannot be updated once their key is surfaced. 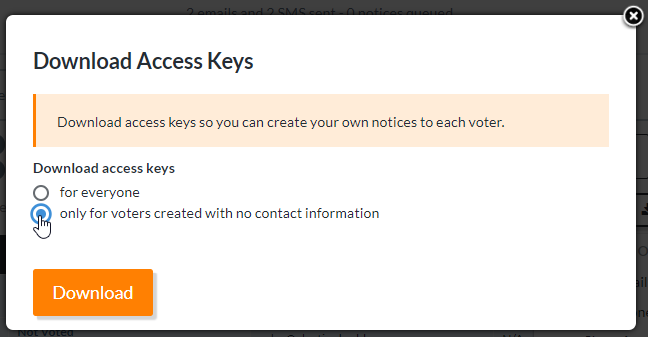 To download just keys for your voters without contact information, choose "only for voters created with no contact information". You will be provided with a CSV of your voters' keys. 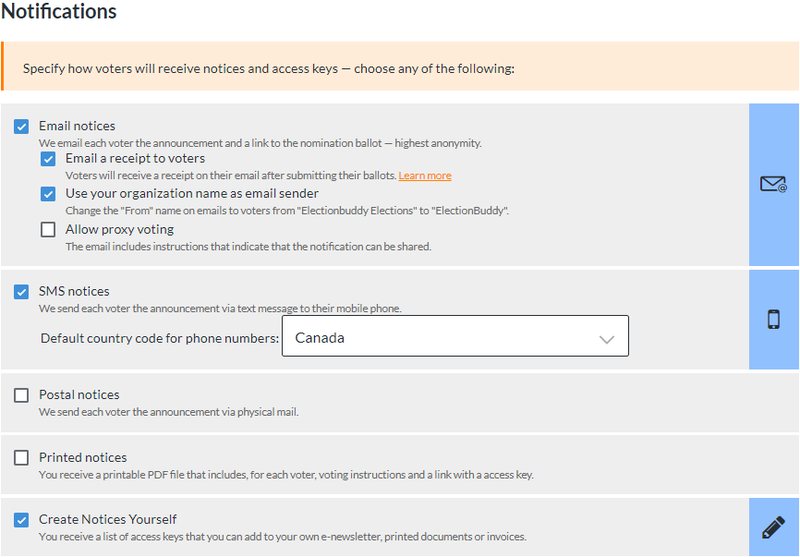 The CSV will contain information about the website that voters need to visit to enter their access key and vote (https://electionbuddy.com/ballot), as well as the access keys for each voter. The CSV will also contain ballot links for each of your voters' access keys. A ballot link is a one-step process to access the ballot: the voter's access key is embedded in the link, so clicking the link brings the voter to the ballot and authenticates them in the same step. All voters whose keys were downloaded will now show their status as "Key Surfaced" in your voter list. Populate a mail merge with your favorite e-newsletter or email program. Use your favorite word processing program to create printed notices for each voter. Include them on annual statements. Call the voter and pass their voting information along to them. To vote, your voters simply need to visit https://electionbuddy.com/ballot, where they will then be asked to enter their access key.